Bicycles for all types of bike rides, whether you prefer to stay on asphalt or on steep bike paths. Perhaps you would rather have an electric bicycle for an easier ride. 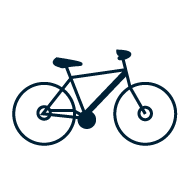 Choose the type of bike, wheel size, whether you need a male or female model, and how many gears it should have. You can also choose the type of brake, frame size, weight and colours.